Recep Tayyip Erdogan is a lucky man with a good sense of timing. The killing of Jamal Khashoggi in Saudi Arabia’s Istanbul consulate is of course a tragedy. But Erdogan, the Turkish president, immediately saw in this a huge opportunity. It amounted to a gift that came at an opportune moment. Erdogan had been in a financial and strategic tight spot before the Khashoggi affair. His country’s relations with Washington was on the verge of collapse because of the jailing of, since 2016, Andrew Brunson, an American pastor. The Turkish lira was in its nadir. After an unprecedented amount of arm twisting by the Americans, involving trade sanctions, Erdogan caved. Brunson was released. But while a total breakdown of bilateral relations was averted and the lira stabilized, Erdogan had suffered a major defeat. Erdogan had found his match in the erratic and impulsive temperament of Donald Trump. So, he is probably delighted that the Khashoggi affair now gives him much-needed leverage with both Washington and, perhaps more importantly, with Riyadh – his regional nemesis since the toppling of the Muslim Brotherhood in Egypt. Erdogan is doing his best to turn this to his advantage. After a few initial lame attempts at presenting himself as a defender of free speech – which thankfully no one took seriously since Turkey has among the worst of world records for jailing journalists – Erdogan quickly focused on real business. Turkish authorities began to leak horrific details about Khashoggi’s killing. In doing so, they managed to keep the story alive in the world’s media. American and global press coverage, in turn, kept the pressure on the Trump administration. It was not lost to anyone that Erdogan was in control of the media narrative. He was “playing this like a Stradivarius,” said F Gregory Gause, an American scholar of the Middle East, in describing Erdogan’s slow drip of leaks. In addition to details about a 15-person hit team arriving in Istanbul, it was hinted that Turkey had additional material about how the killing was carried out. Saudi Arabia finally acknowledged last week that Khashoggi was killed by rogue elements that acted without the knowledge and consent of the regime. Unsatisfied with the Saudi explanation, however, Erdogan immediately declared he would reveal the “naked truth.” Rumors circulated that Turkish authorities had audio recordings that directly implicated Saudi Arabia’s Crown Prince Mohammed bin Salman. Trump sent his CIA director to Ankara just before Erdogan’s much anticipated speech, to avoid being blindsided. Yet Erdogan revealed nothing new. He made no claims that he hadn’t already made before. If indeed he knew more, he kept this to himself. The speech was a damp squib. 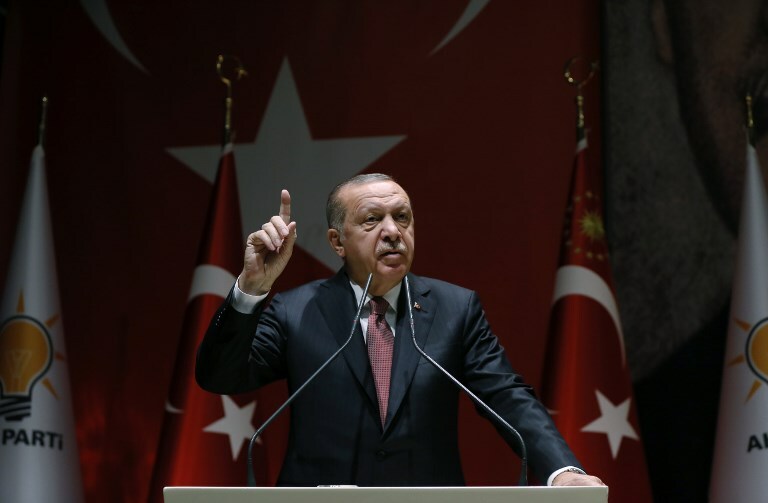 A ruthless media operator, Erdogan would not have been expected to let the opportunity to keep the momentum going simply slip through his fingers. He would have wanted to keep the world in suspense further, ensuring that the case remains front-page news. But by Thursday, the story was starting to lose traction. All this leads to a simple question: Why? What’s Erdogan’s ultimate objective? The answer: Erdogan has a short-term transactional approach in pursuit of financial gains and a longer-term strategic objective aimed at weakening the Saudi-UAE-Egypt axis in the Middle East. On the transactional front, he is now well placed to extract concession from the Trump administration that has built a Middle East strategy that hinges on cooperation with Prince Mohammed – particularly in the containment of Iran. To get Erdogan’s cooperation in shifting attention away from the Saudis, the Trump administration can dangle many carrots. The White House could provide Turkey an exemption from new sanctions on Iranian oil exports. The US treasury department could reduce fines to a Turkish state bank – Halkbank – that had violated sanctions on Iran. And the Pentagon could scale down its cooperation with Syrian Kurds in the fight against ISIS, and coordinate its future Syria strategy with Ankara. A deal on any of these three areas would help Erdogan domestically as local elections are approaching. Erdogan could simultaneously try to extort financial help from Riyadh. During his speech, Erdogan spoke respectfully of Saudi Arabia’s King Salman. This was a clear sign that he wanted to avoid burning all bridges with the Saudis. He might offer to engineer a face-saving deal for the right price. Given the recessionary dynamics of the Turkish economy and belt-tightening measures that will cost him votes, Erdogan needs all the financial support he can get to maintain his patronage network. On the longer-term strategic front, Erdogan wants to create breathing space for the embattled Muslim Brotherhood in the Middle East. He still nurtures leadership ambitions for the Sunni Middle East and prefers engagement instead of containment when it comes to Iran. All these objectives create a strategic alignment between Turkey and Qatar. At the end, Erdogan is unlikely to achieve all his transactional and strategic objectives. But compared to only a month ago, he is in much better place to negotiate, thanks to a tragic death on the Bosporus.